Elegant yet Stylish. Traditional Furniture always has a sense of class in it. They are designed and crafted well with a pinch of traditional finish. The vintage look always looks classy, be it modern home or a vintage interior. Having traditional furniture at home still is the first choice for many among us. Keeping in mind the same aspects, we bring to you this fascinating piece of art. Aarsun Wooden Handmade Traditional Almirah / Wardrobe is handcrafted in finest traditional finish by skilled artisans from Saharanpur, Uttar Pradesh. Saharanpur is famous for its Mughal Style Wooden Furniture and Handicrafts. 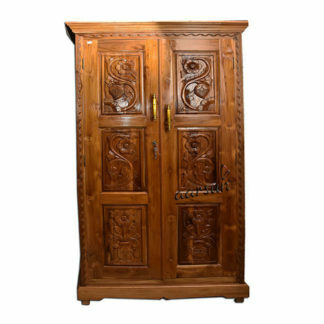 The age old design of this Wooden Wardrobe / Almirah comprises of Two Panel Door with Traditional Floral and Stem Design carved out in front frames. A total of three Frames are set on each Door Panel with Flower and Leaf Design carved out that looks extremely delicate yet because of the material used (Teak Wood) is sturdy enough to withstand harsh weather conditions. The Frame of the Front Door Panels are also braided with curved design work. The top is all traditionally layered out to give it a long lasting and durable finish. The insides can be compartmentalized into single, two or more even spaces with the help of Shelves. It is really up-to your requirement whether to have a single shelf or more. In fact you can get the Wooden Wardrobe / Almirah CUSTOMIZED AS PER YOUR NEED. We at Aarsun Woods excel in customization and believe in MAKE AS PER CLIENT policy. Just select the design you need and have the dimensions jotted down and we will make it for you. For details, contact us at +91-8192999135 / 8266888634 (WhatsApp Available) or chat with us now!! OR EMAIL us at aarsunwoods@gmail.com to have details explained in depth. Wooden Furniture is always an important area to ponder on. And when it comes to redesigning your home in vintage style, look no further. Just buy this Beautiful Wardrobe that can be customized as per your home interiors.